Las Vegas Ballpark will have biggest videoboard in minor league baseball — and bigger than those at stadiums of five Major League Baseball teams — the Avaiators announced Monday. Las Vegas Ballpark will have the biggest videoboard in minor league baseball — and bigger than those at stadiums of five Major League Baseball teams — the Aviators announced Monday. 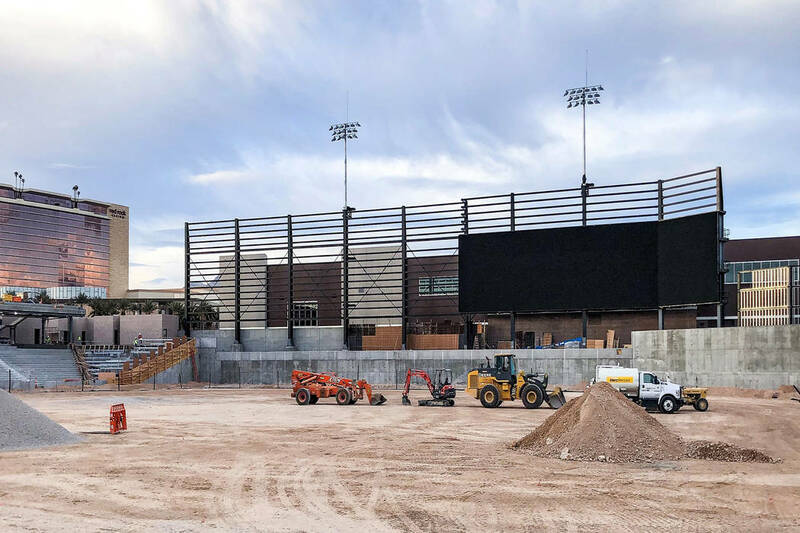 The stadium, which is being built at Downtown Summerlin, is scheduled to open April 9 for the Aviators’ home opener against the Sacramento River Cats. The 3,930-square-foot videoboard is being built with Daktronics and will feature a unique angle to match the contour of the outfield wall. The display will have the capability to show one large image or be divided into multiple zones to show any combination of videos, photos or statistics. The Ballpark also will feature a a gate entry video display measuring 3.5 feet high by 41 feet wide at the main stadium entrance. Bill Bradley can be reached at bbradley@reviewjournal.com or 702-387-2909. Follow on Twitter at billbradleyLV.